The proposals include residential development, in addition to a primary school, community centre, open space and associated road infrastructure. To view these outline development proposals, the public were invited to a consultation event held at the Lordswood Leisure Centre on the 8th November 2018 between 1pm – 8pm, where members of the consultancy team were in attendance to respond to any queries and record any feedback received. For those who were unable to attend the event, or wish to view the emerging proposals again, the consultation material is now available to view by clicking on each of the links below within the ‘Plans & Documents’ tab. The feedback form provided at the consultation event has also been digitised to allow further comments to be made. Simply click the ‘Feedback’ tab below. 2. What do you consider are the most important factors affecting development at East Hill, in order of priority to you (with 1 being the most important and 5 the lowest)? 3. The illustrative layout incorporates an education site, open space and other community facilities as well as affordable (25% of the total) and a range of open market housing. Do you agree this is an appropriate mix of land uses? 4. The layout includes a new road link from North Dane Way to Pear Tree Lane. Do you agree this east to west linkage from Lordswood to Hempstead could be part of a package of measures that could improve traffic circulation in this part of Medway? 5. 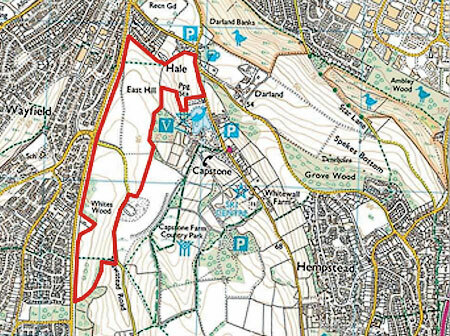 The illustrative layout seeks to improve pedestrian and cycle linkages from the existing neighbourhoods to the Capstone Country Park. Do you agree this is a sound design, social and recreational objective?